ART in a coffee shop! So for the past month of April I have had the opportunity to display some art with two great artists, Matt Schlosky and Mike Gezze. Matt and Mike are friends of mine who I met at CCAD. Mike was just out here in San Francisco visiting from Cleveland, and Matt is a local artist. Both have great work, so check it out if you are in San Francisco. Its at Sundance Coffee, on the corner of 24th and Harrison, in the Mission. 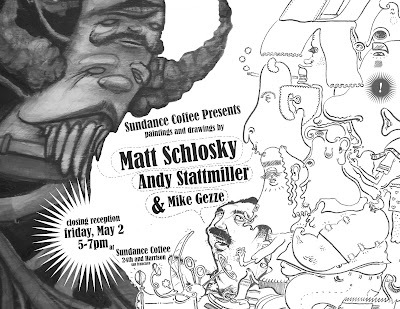 There is a closing reception this Friday from 5-7 so be sure to stop by if you get the chance.